The Eleven Madison Park cookbook is packed full of elegant photography and creative dishes. Eleven Madison Park in New York is the well-known three-star restaurant of this month's guest chef: Daniel Humm. It is one of the world's 50 best restaurants, ranked at 24. All of Daniel's dishes are utterly stunning. 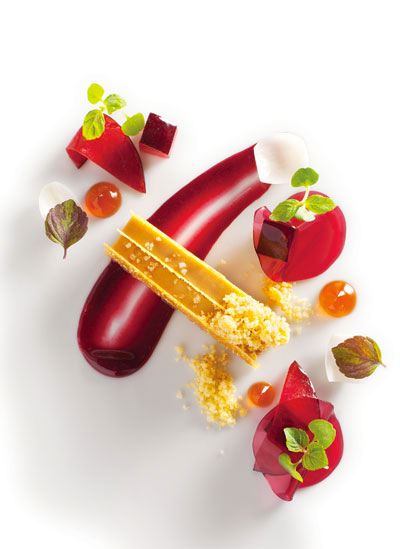 As you can tell from his compositions, the style at Eleven Madison Park is very fresh and refined. Together with Will Guidara, chef Daniel Humm has made the restaurant a great success. Rather than using an à la carte menu they instead use one menu printed with sixteen ingredients that refer to the dishes available. So although you roughly know what you can expect on your plate it will still always be a surprise! This philosophy, based on primary ingredients, is quite similar to that of Gastronomixs: forward with basics. Be inspired by the book and his compositions. Take a good look at the way dishes are put together and at their colour combinations.